What happens during the fermentation of soybeans into tempeh? Generally it is agreed that not only is the flavor, aroma, and texture of plain cooked soybeans enhanced during the fermentation process, but there are several nutritional benefits derived in the process as well to make the beans more easily assimilated by the human body. This is done by the main mold Rhizopus oligosporus, and other minor organisms or their enzymes hydrolizing proteins, carbohydrates, and fats to create smaller and more digestible units. This process makes the protein in tempeh more digestible and usable. Free fatty acids increased from 0.5% in the unfermented control to 21.0% in the dehydrated tempeh (with the same moisture content). During fatty acid synthesis, Rhizopus sp. produced only gamma-linolenic acid (GLA) instead of alpha-linoleic acid. GLA is a prostaglandin and leukotriene precursor. It is used therapeutically to decrease the cholesterol and triglyceride content in blood. It is not found in soybean (3). During fermentation, the principal changes in carbohydrates are the rapid decrease of hex-oses and the slow hydrolysis of stachyose, the flatulence factor in beans (4). This makes tempeh a more socially acceptable soybean product. Steinkraus (5) summarized the biochemical analysis of tempeh. The most significant changes are in the proteins and vitamins. Ammonia (% of total nitrogen) increased from 0.1 to 1.7. Percent nitrogen soluble in water increased from 6.5 to 39.0. Percent nitrogen soluble in trichloroacetic acid increased from 5.9 to 28. There were no significant changes in the amino acid patterns between soybeans and tempeh (6). It is likely that there is no de novo synthesis of amino acids, but only a degradation and consumption of soy protein by the fungi. 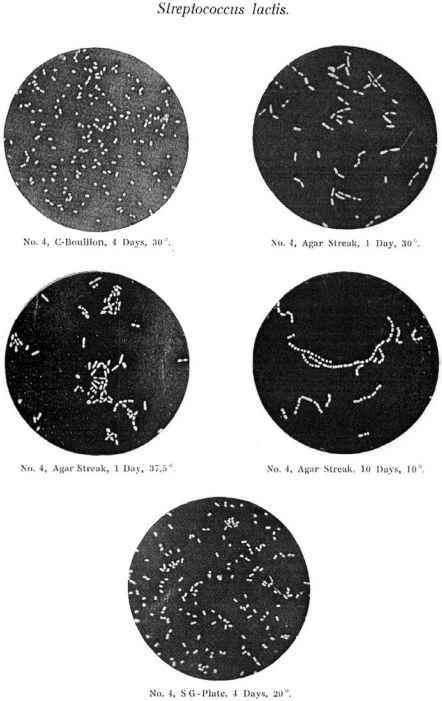 Steinkraus (5) also summarized reported work on changes in vitamins during tempeh fermentation. Riboflavin increased by 2-47 times, niacin increased by 2-7 times, and vitamin B12 by 33 times. Thiamin, unfortunately, decreased. Panthothenic acid has been reported to stay the same or increased by 2-4 times. Pyridoxine increased by 4-14 times. Biotin and total folate compounds were respectively 2.3 and 4-5 times higher in tempeh than in unfermented soybeans. The variations in reported changes may be due to the way tempeh was made in various laboratories and locations, as well as the beans and microorganisms associated with them. For example, according to this author's experience, the production of vitamin B12 fluctuated considerably even under similar fermentation conditions in the same location. An isoflavone identified as 6,7,4'-trihydroxy isoflavone (called Factor 2) has been reported (6,7). The antioxidative effect of factor 2 on retinol was about the same as DL-alpha-tocopherol, and three times that of genistein. Other isoflavones were later reported (8,9). In Indonesia, tempeh is widely used to ween babies off mother's milk and to help patients recover strength from dysentery and other ailments of the intestinal tract (1). R. oligosporus NRRL 2710 was reported to produce an antibiotic active compound against a number of gram-positive bacteria including S. aureus and B. subtilis, as well as the gramnegative K. pneumoniae (10). It was demonstrated later that K. pneumoniae and R. oligosporus NRRL 2710 grows well together in tempeh fermentation. There was no evidence of K. pneumoniae inhibition by the mold (11,12). This may help explain why tempeh is provided to patients with dysentery and other ailments of the intestinal tract. Phytate is considered to exacerbate mineral deficiency in human by hindering absorption in the gut. Reduction of phytate was reported to be 22% during tempeh fermentation due to phytase active in R. oligosporus (13). This again demonstrated the benefits of tempeh. A home-based tempeh factory can be operated by a small family group of four adults and several small children. Fifty kilos of tempeh are made each day in the house. Cleaned soybean is cooked in the early morning. At mid-morning, the cooked beans are cooled manually in a large bamboo colander placed on the floor. The tempeh from the day before is incubated in small 3'' x 3'' perforated plastic bags, each of which weigh about 3 ounces. These small cakes are incubated for 2 days on wooden slats in a dark room. A bicycle-powered mill, the colander, and an aluminum cooking pot and heat sealer are the only pieces of equipment. The 3-ounce cakes are sold to restaurants and in the market for 150 rupiah (about 6 US cents). A substantial medium operation produces 750 kilos of tempeh, 7 days a week, 30 days a month. The manufacturer employs 10 young men in this operation. The soybeans are cooked in delidded 55-gallon drums placed over propane burners. The hulls are skimmed off the beans manually with plastic colanders by two persons. Two others cool and package cooked beans in perforated plastic bags in another room. The beans are piled not on the floor but on a piece of white canvas. Tempe Murni sells 250 grams of finished tempeh for 400 rupiah (U.S. 160) to their distributors, who sell it in the market for 500 rupiah (U.S. 210). Yogyakarta has always been viewed as the cultural capital of Indonesia, it has the highest per capita consumption of tempeh in all of Indonesia. On a weekly basis, the average person in Yogyakarta consumes nearly 200 grams of tempeh versus only 75 grams per Balinese citizen. This shows in the local market which is totally inundated by a large variety of tempeh products—both raw cakes and tempeh prepared in various sauces. These products are supplied mainly by one large tempeh maker. This innovative plant produces 5000 pounds of product each day from a 1500 square foot area. This shop does have a gas-fired boiler and copper kettle for cooking the beans but everything else is done with the same level of technology witnessed elsewhere (bamboo colanders on the floor for mixing and packaging, etc.). What is unique about this shop is the ingenious barter system that exists here. The main operation is run by a paid staff of 24 people but the filling is almost all done manually by local workers, They seal the inoculated beans in plastic bags, sometimes melting the plastic by running it near the open flame of a cloth wick stuck into a coke can filled with kerosene! After the bags are sealed, the workers pack them up into the cloth sacks the beans came in, load them onto bicycles, and pedal the load home. There they incubate the beans for several days, and when the beans are white and ripe, take them to the local market for sale. In Yogyakarta, small, 1 ounce packages of tempeh incubated for an extra long time in banana leaves are available and sold for 25 rupiah (about U.S. 10). 1. 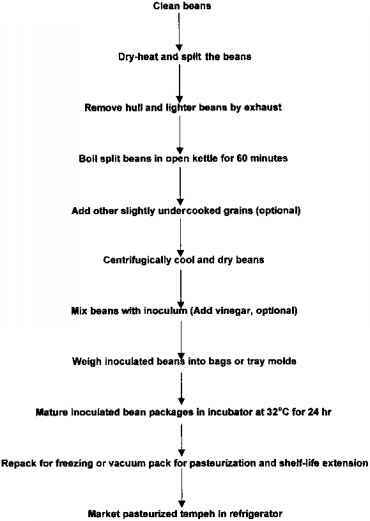 Beans are soaked overnight in what is known as the prefermentation. 2. Early the next morning the beans are dehulled and split, using anything from mills to hands and feet. 3. Beans are cooked in open kettles where more dehulling takes place. 4. Cooked beans are placed in a large woven colander about 3 feet across and placed in front of fans to dry. 5. Cooled beans are inoculated with the culture. Most culture comes from the same source, a local Indonesian lab, and is a type of Rhizopus that is incubated at around 30 °C for 48 hr. 6. Inoculated beans are now scooped into perforated plastic bags or banana leaves. Whereas the perforated plastic bags were the most common way of incubating tempeh, most cooks preferred tempeh incubated in banana leaves. Observations in the market bore this out as tempeh incubated in the leaves was consistently of higher quality than that in the plastic bags. Marketing final product Figure 3 Flowchart of tempeh manufacturing in Indonesia. 7. Incubation takes place in a room or closet where inoculated beans sit out at room temperature on wooden slats. 8. After 2 days the tempeh is sold in its perforated incubation bag or banana leaf in the marketplace. 1. Whole soybeans are heated and split dry in a mill. 2. The split beans and hulls fall into a tube where the lighter hulls are sucked out from the top by connecting it to an exhaust fan. The heavier beans fall to the bottom of the tube into a collection bucket. Market pasteurized tempeh in refrigerator Figure 4 Flowchart for tempeh manufacturing in the United States. 3. The split beans are cooked at a boil for 60 min in an open steam jacketed stainless steel kettle. 4. Other grains may be added toward the end of the cooking time. These grains are always slightly undercooked. The rule here is to cook the grains for about half as long as one normally would if one were preparing them to eat at our own supper table. 5. Cooked beans are now placed into a centrifuge. These have stainless steel baskets and the beans are spun rapidly for a short period of time to cool and remove excess water. 6. Cooled beans are placed in a horizontal mixer where they are mixed with the innoculant and other grains. Some people acidify the beans with a small amount of vinegar at this point. 7. Beans are now either placed in a mechanical scale of some kind or weighed out by hand into perforated bags or tray molds for burgers. 8. Bags of inoculated beans are now laid flat on perforated trays and placed inside an incubation room where they are heated at 32°C (89.6) for 24 hr. 9. At this point tempeh is now bound into a firm, fragrant white cake. Some workers slip an outer bag over the tempeh at this point and freeze the product. 10. Most commonly at this point, finished tempeh is now vacuum packaged and then steam or hot water-pasteurized to extend the shelf life. 11. Tempeh is now cooled down and sold refrigerated it has a shelf life of approximately 3 months. How fermentation works in tempeh? What are the main process that is used to preparing tempeh?